is for Budget, and for a Big Day in the life of the Coalition. 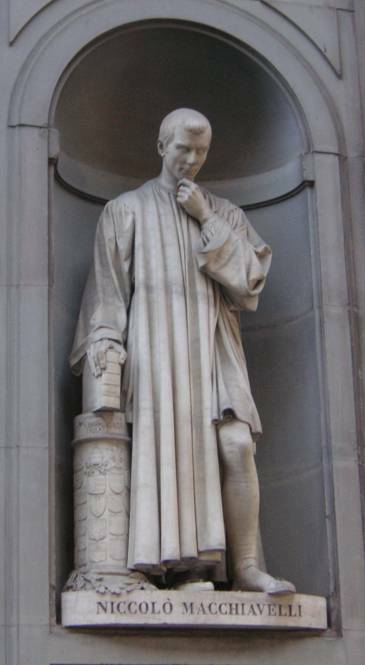 Machiavelli had it right: if the new Prince has anything he wants to achieve that may be unpopular, best that he take up his New Broom and do it straight away. This is exactly what the UK populace is braced for right now, and no better opportunity will ever occur. Cameron and Osborne enjoy one other major advantage: Parliamentary conditions could scarcely be more favourable, with the LibDems formally onside, and Labour's response to come severally from an ineffectual stopgap leaderette, a peeved pussycat of a former chancellor, and five lacklustre leadership candidates, mewling and posturing as they try to differentiate their empty oppositionist brands. The Government benches hold vast stockpiles of ammunition with which to blow them away at each PMQ for five years, and Cameron is man to do it. More dangerously entrenched are the legions of subsidy-wallahs, special interests and, yes, genuine interests, armed with arguments and heart-rending cases by clever lobbyists (who will encourage them to part with their last pennies to pay for professional pleading), fronted by more or less persuasive advocates (who will not all be as repellent as Bob Crow), gleefully hosted by the BBC and Channel 4 News. Hard-case atavistic big-staters and revivalist Trotskyite impossibilists dream of mass movements marching on London to bring down the walls with their charmless chant: "no ifs, no buts ..." Anti-CGT poujadists stamp their feet on the other side of the field. So the battle-line s are forming up. And just as Old Nick counsels early action, so the great strategist von Moltke (the Elder) cautions that early dispositions, if badly-made, are exceptionally difficult to correct later on. Ring-fencing the NHS might be an example of just such a poor early call. Act quickly - and act cleverly as well ! No-one said it was going to be easy. We've never been entirely convinced about Osborne in these parts, and now is his (only) chance to prove us wrong. We may be pretty sure he's read his Machiavelli. Let us hope his Big Budget meets the Moltke test as well. I read alot of comments saying ring fencing the NHS was a mistake. With an ageing population though even keeping the same level of service will cost more. Also, ringfencing the total doesn't mean that big cuts in certain areas can't be made freeing up money for better quality treatment. It may be possible to bring other areas under the health budget too, providing an effective cut. And politically it provides an easy answer to the 'baby eating tories' charge that everyone can understand - this is the most important function as I don't think much of the population understands the higher level economic arguments going on. ND - I feel that Cameron ought to milk the coalition arrangement for all it's worth, "It's not just Tories thinking like this - the Lib Dems sitting beside us as we check the books." but can the coalition withstand the splits that this budget is likely to cause ? 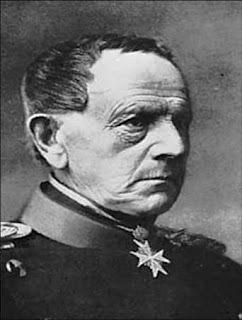 Moltke the elder theorised that only the beginning of a military operation was plannable. He was right. We shall see if Osborne is Moltke the elder or Moltke the younger. Wasn't it Von Moltke who warned that enthusiastic fools were the were the worst kind of staff officers to have? I am sure that Osborne won't do the business. There is very little practical difference between Badger and Boy George apart from the fact they are on different sides. Osborne could simplify the tax system in many ways, one example being to roll NICs and IT into one, making it open ended, and scrapping the 50% rate. But he won't. He could scrap VAT and replace it with a local sales tax (no business registration? - so you pay the tax). But he won't. He could implement the principle that no-one paying tax gets a benefit (thereby scrapping working/child tax 'credits', child allowance, etc). But he won't. It will be a wasted opportunity. Oh dear, Anon at 3:00pm is Budgie. Thanks for the Budgie Budget ! Combination of NICs and IT would be good. One thing I have wondered is that while there is nothing that can be directly done about the inflated public pensions already being paid out (and private pensions that have benefited from more generous tax relief than is going to be available going forward) there may be indirect ways in which some of this past excess can be clawed back. Combine NICs (which pensioners do not currently pay) with Income Tax and then raise the state pension and change the pensioner thresholds so that lower income pensioners see a rise in income and higher income pensioners see a drop. At the moment all the pain seems to be being borne by the young - record youth unemployment, student fees - time for some of the wealthy baby boomers to pay up for all the damage they've done.